This really is it! The Final Leg! 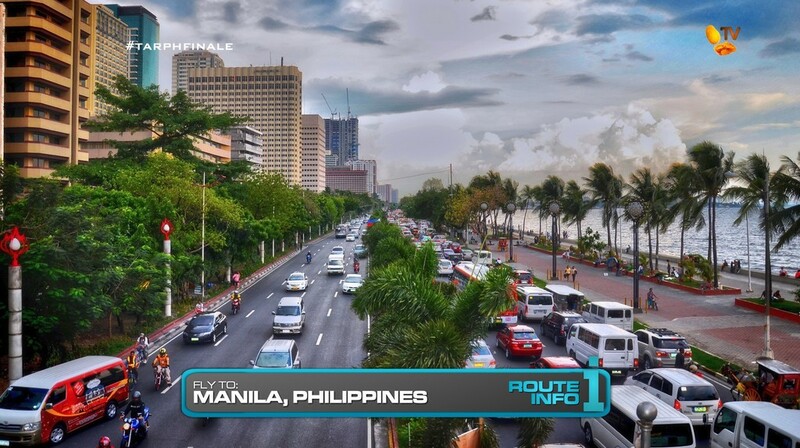 Teams will be heading home and flying to Manila, Philippines! Connecting through Johannesburg (on Comair) and Hong Kong (South African Air), teams will arrive via Cathay Pacific at 9:50am. 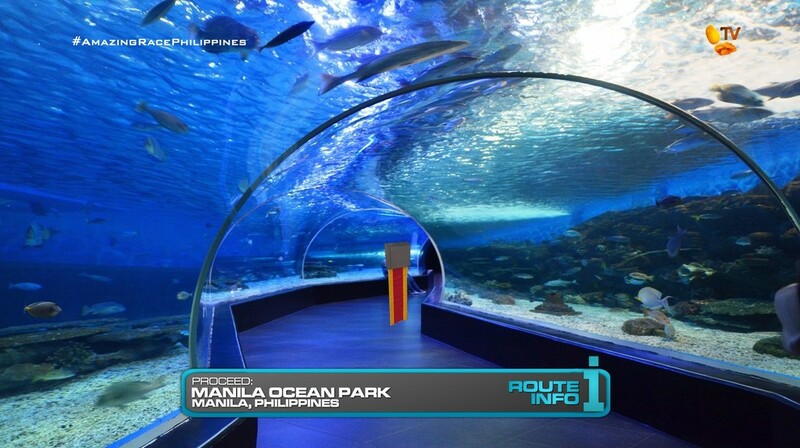 Once in Manila, teams must hop into taxis to take them to Manila Ocean Park. Here, teams will find a Road Block: Who wants to find buried treasure? Teams’ Road Block count is reset to zero for this Leg. 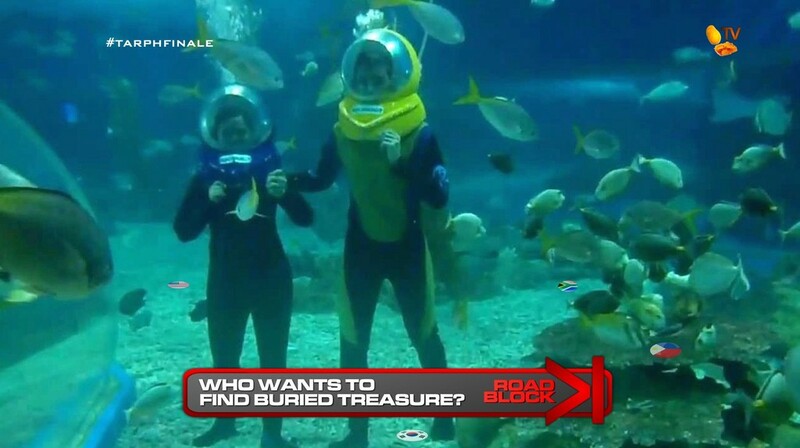 For this Road Block, teams will put on aquanaut suits and jump into the fish tank where they will need to search for nine flag medallions representing the nine countries they have visited on the Race. Once teams have the correct medallions, they will receive their next clue. Teams must now make their way to the park in front of Glorietta 3. 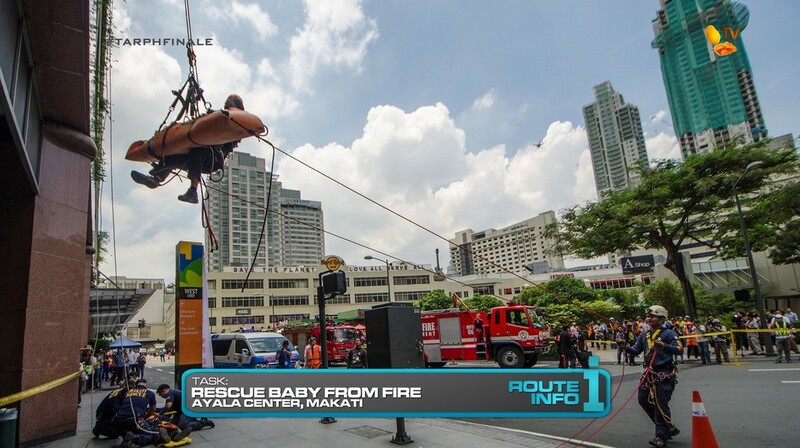 A few months ago, Ayala Center was the location of one of the simulations in the Metro Manila shake drill. For this task, teams will work as emergency responders who will search the smoke filled building for a crying baby. They must take the baby and bring it to safety by performing a high angle rescue and rappelling from the burning building down to the ground. Once the baby has safely been reunited with its parents, teams will receive the next clue. 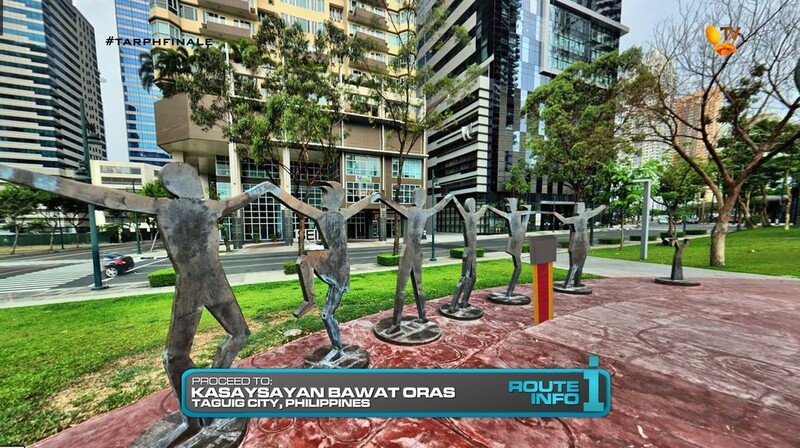 Teams must now find “Kasaysayan Bawat Oras.” Teams will need to figure out that it is a public art installation in Taguig where they will find their next clue. That clue directs teams to Flying Trapeze Philippines a couple of blocks away. Here, teams must complete a flying trapeze maneuver known as a “catch” to receive their next clue. 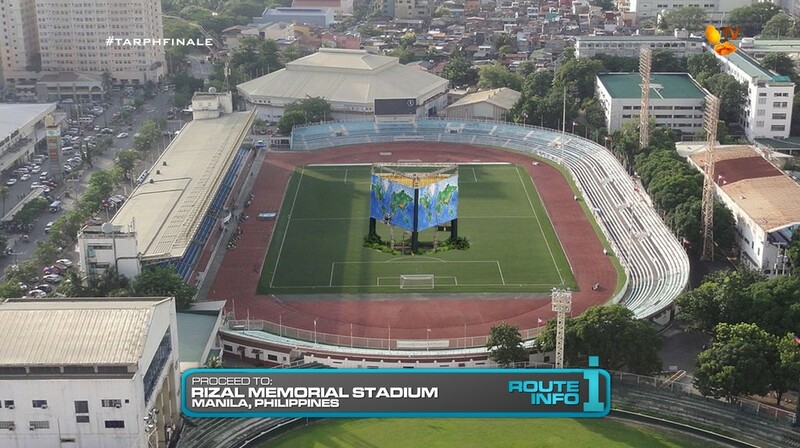 Teams must make their way to Rizal Memorial Stadium. And here, teams will find the 2nd Road Block: Who can connect the dots? The team member who did not complete the first Road Block MUST complete this one. For this Road Block, one team member will be harnessed and must loop a rope through a series of carabiners on this large world map. Each carabiner represents one country they visited on the Race. Once the rope route is correct, teams will receive the next clue. 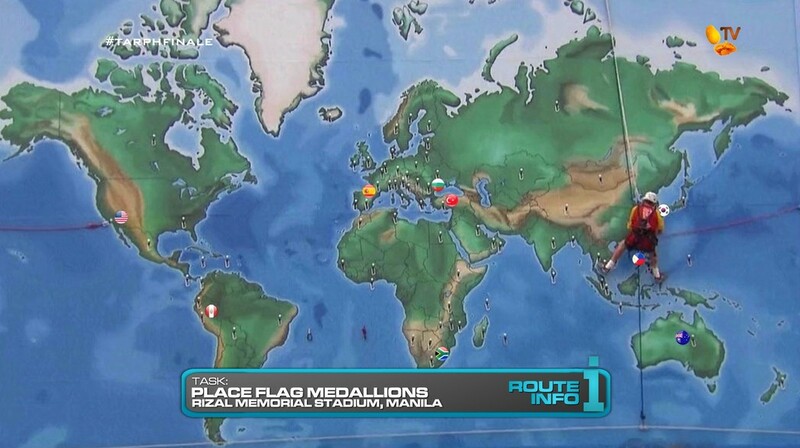 While the team member completing the Road Block is still harnessed, the non-participating team member can now help as they place the flag medallions found in the first Road Block onto the correct spots on the globe. Once all flags are placed on the correct countries, teams will receive their final clue. 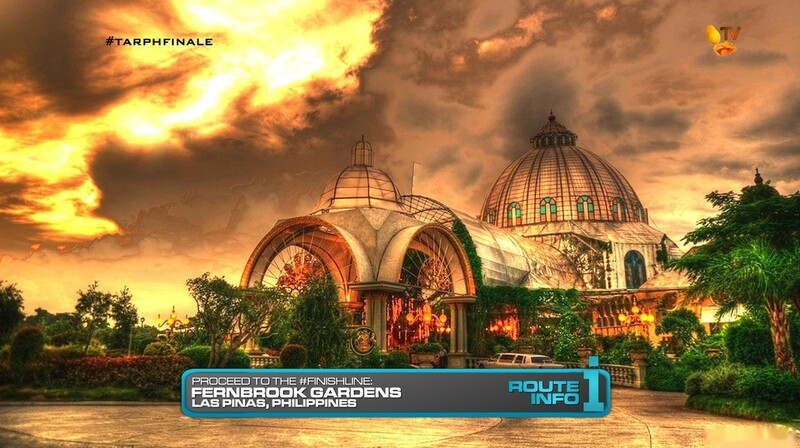 And that final clue directs teams to Fernbrook Gardens in Las Pinas, the FINISH LINE! Any of these prizes they will be able to donate to the charity of their choice, if they so choose. First to this Leg. I actually like this Leg a little more than the Final Leg of season 6 “All-Stars.” The tasks are all challenging enough that teams won’t just fly through them and they offer opportunities for teams to both get ahead and catch up. Now Manila as the Final Destination, especially with celebrity teams is risky. But then again, TARPH2’s first Leg went almost completely unspoiled. lol So, maybe people won’t care to tweet sightings. Then again, if TARPH ever did reach a season 7 and/or have celebrities, the interest in the show would probably be pretty high. 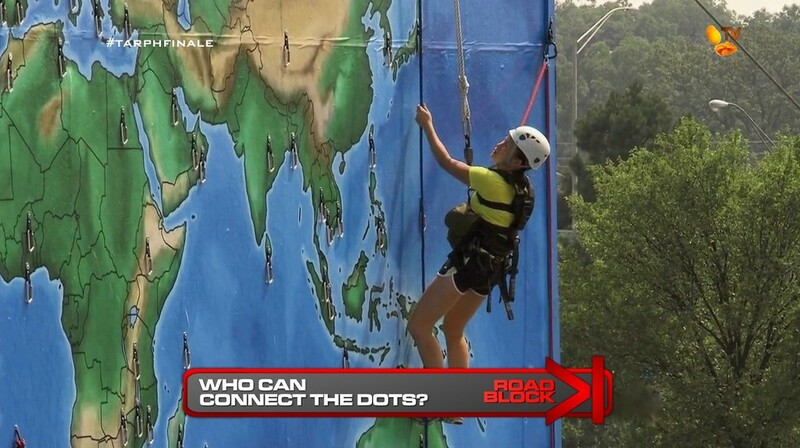 In the first Road Block, the edge goes to teams who have paid attention to the countries they’ve visited on the Race and their national flags. But the task in the penultimate Leg should’ve at least jogged their memories a little. This task has the possibility to really wreck a team if they have no clue. After the July #ShakeDrill in Metro Manila, I thought the any one of the simulations would be a good task for a Manila Leg. The rescue out of the Ayala Center and rappelling down is the most typical kind of TAR task you can have. And the Final Leg should have a thrilling task like this. 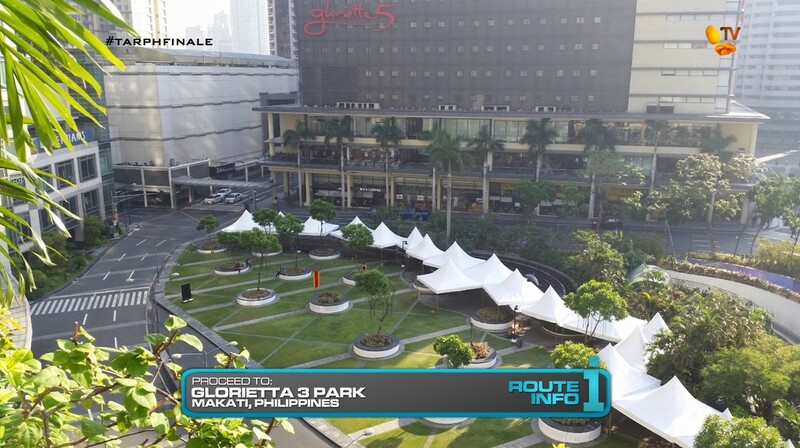 The Route Markers at the park in the middle of the intersections at Glorietta is a simple location. As is the art installation in Taguig which I stumbled across Googling the internets. The trapeze task is kinda random, but they’re in Taguig and it’s a task that hasn’t been done before in any form on TARPH. And the final task is recycled from TAR19. Now, in TAR19, this map task screamed “Amazing!” in the previews. But in the actual episode, it fell really flat. One of the biggest final task disappointments. Here, hopefully teams will have a little more trouble finding the countries they’ve visited. Though the clues will also still include the country shapes like they did in TAR19 as a way to get teams somewhat aware. The “medallions” are just an extra added component of this final task. And since they already needed to search for them in the first Road Block, it should be pretty easy to place them in the correct spots. 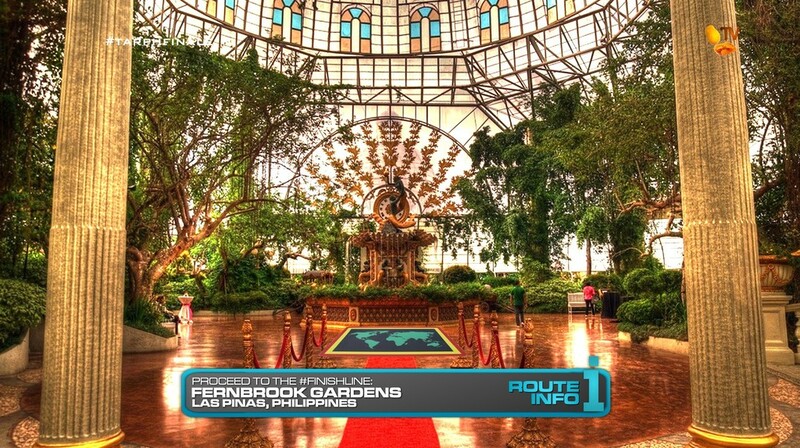 For the Finish Line, I only just recently learned a place called Fernbrook Gardens exists. Especially for a Celebrity Edition, a secluded location that’s also fancy and sosyal would be perfect. And this wedding venue does look interesting. So Finish Line it is. One can only hope if TARPH lasts this long, they’d be making plenty of money and have plenty of advertiser support to keep going and really go for the big locations around the world.